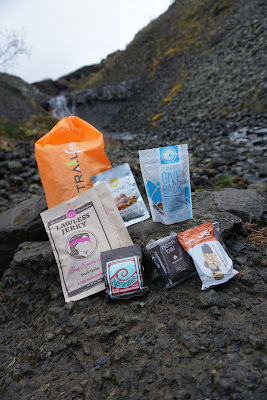 An unpacked Trailfoody snack bag in Iceland. 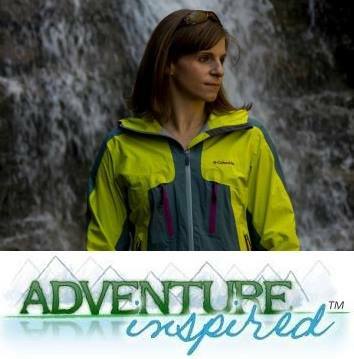 Imagine, you're preparing for a hike at the last minute, maybe the night before. You're scouring your pantry and fridge for snacks, but find the same old stuff you always take on hikes. You know you don't have time to run out and grab anything else. 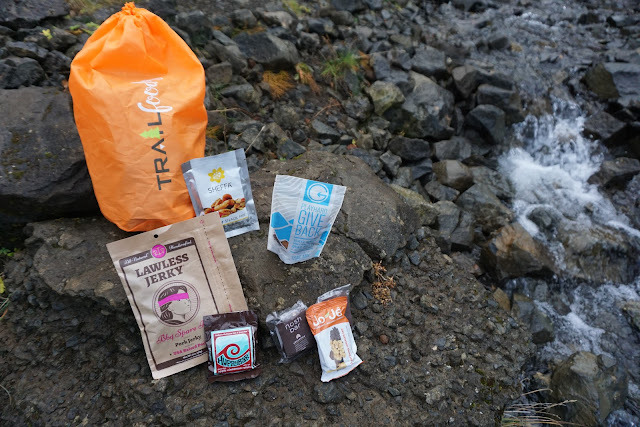 Trailfoody is a subscription service designed to help adventurers explore a variety of wholesome, tasty trail snacks. Depending on who you are and how often you adventure, you can sign up for different types of subscriptions designed to keep you fueled and excited. The boxes are packed with different specialty snacks each month. Options include things like dried fruit, jerky, artisanal trail mixes, energy bars, even small meals that don't require napkins, utensils, or coolers. Products from small businesses as well as those with a focus on natural, organic foods are prioritized. Subscribers opt in based on activity level or family size. The Wanderer is for individual adventurers going on 1-2 outings per month. Go on three or more outings per month as an individual? Upgrade to the Pathfinder. If you adventure once or twice per month with a buddy, the Deuce subscription is for you. And finally, families have the Family Pack option, which is customizable based on the number of people in the family. Trailfoody also lets you cancel deliveries or skip a month at any time, and if you're interested in trying before subscribing, there's an option to order an individual Wanderer bag without a subscription. In preparation for a trip to Iceland where I anticipated going on multiple adventures, Trailfoody sent me a complimentary one month Pathfinder package. When the box arrived, inside were three bright orange stuff sacks with identical mixes of snacks to try. As a subscriber, you'll receive the orange stuff sacks in your first shipment, and after that, snacks are shipped in clear bags to refill the stuff sacks. The stuff sacks definitely came in handy for keeping snacks organized, and when we'd eaten all the snacks, I stored clothes and other items in them. After I ate the snacks, I used the stuff sack to store other items in, and one of them was our food bag for the entire Iceland trip! My snack bags each included a package of Lawless Craft Jerky, a Huppy Bar, a Nosh Bar, Play Hard Give Back trail mix, Sheffa snack mix, Emmy's Organics cookies (not pictured because we ate them), and a JoJe´ bar. I hadn't heard of any of the brands except Emmy's before receiving the snack bag; it was fun seeing familiar trail snacks like jerky and bars, but trying new versions and learning about new companies. It was also a good balance of savory and sweet flavors. The snack bag was much more than I needed for a single hike; I ended up eating the snacks throughout our week in Iceland and coming home with leftovers. As an individual, I'd likely stick with the Wanderer subscription even if I planned on multiple outings each month, or the Deuce for my fiance and I. And of course, none of the snacks required refrigeration, so we'll likely have a few of the bars on hand for a while! Win a One-Month Pathfinder Trailfoody Shipment! Think you'd like to try Trailfoody? Great! We've partnered up to give one lucky winner a Pathfinder one month shipment. The giveaway is open those able to provide a United States-based shipping address only. Email addresses provided will be sent to Trailfoody, but it's simple to unsubscribe from emails at any time!